Bad Batteries? Bad Clamshells? What to look for. Under the authority of the National Telecommunications and Information Administration (NTIA), the DOI and USDA have designated specific frequencies nationwide for assignment and use by NIFC to support their all-risk management missions. The radio frequency assignments are Freedom of Information Act (FOIA) release-exempt and are to be protected as "Sensitive Data." If you have any questions concerning the above, feel free to contact the Communications Duty Officer (CDO) or Mike Tuominen. Most radios display the radio's operating software version when the radio is first turned on. View software version by: Turn radio on. Press 2nd gray button (it has 2 dots) on left side 5 times. Radio enters service mode. Software version is the first number displayed. Turn radio off and then on again to reset after checking software version. DO NOT USE your radio until it is reset. Contact your local radio technician to update your radio's software. The voiceboard audio output degrades at cold temperatures or cuts out completely when temperatures are in the low forties (degrees F) or below. The problem has been found to be an improperly low bias voltage to the audio amplifier in the voiceboard. A fix has been identified and when repaired the voiceboard functions down to -30degC (-22degF) without issues. Unfortunately the fix will not be fully implemented until winter, therefore this problem will still be an issue for the upcoming 2019 fire season. The problem can be mitigated by querying the voiceboard in the evening at the end of operations when temperatures are warmer rather than first thing in the morning before operations when temperatures are coldest. Contact Bill Forsyth for more information. In order to include the new accessory kit, 4312's and 4370's must now be ordered with two separate line items (separate S numbers). (i.e. S.1 = 004312 and S.2 = 004100 and S.3 = 004370 and S.4 = 004100). Due to airline shipping weight restrictions, the 4312's and 4370's will be shipped as 2 separate kits each. When ordering a 4312 and/or a 4370 you must also order a 004100 Mountain Top Accessory Kit. The 4312 and 4370 fiberglass boxes will continue to house the radio equipment while the 004100 Mountain Top Accessory Kits will contain the accessories used to install the radio equipment. These two boxes must be kept together at all times. It is recommended to leave the 004100 on the mountain top with 4312 and/or 4370 when they are deployed. 004312, 004248, and 004370 kits will now contain a new antenna base. The base is designed so that the use of tape to hold the radials in place is no longer necessary. Desiccant Packs are now included in 004312, 004248, 004370 kits to reduce moisture and humidity. DO NOT discard desiccant packs. DOI and USDA WO Frequency Managers are now requiring the CDO to submit NTIA Interference Reports for all radio interference issues that adversely impact incident communications. Radio interference must be reported to NIFC CDO (or COMC when assigned. Minimum reporting information: location, radio frequency, time and date (including interference duration), and sound or intelligent audio source for interference. By this Public Notice, the Public Safety and Homeland Security Bureau (Bureau) announces a streamlined procedure for the Commission to authorize non-federal public safety entities to use the forty channels that the National Telecommunications and Information Administration (NTIA) has designated for interoperability. This will mean that some of the repeaters used by the NIRSC to support project fires and All-Risk Incidents C8 - C17 and L8 - L14 (Federal Interoperability Channels) may be subject to interference. It is our understanding that if non-federal public safety entities who cause interference when identified have 24 hours to shut down. The FCC has offered to train the NIICD staff on how to use their portable direction finding equipment to track down any interference issues on project fires. "The Enforcement Bureau (Bureau) of the Federal Communications Commission (FCC) has observed that a growing number of conventional retailers and websites advertise and sell low-cost, two-way VHF/UHF radios that do not comply with the FCC's rules. Such devices are used primarily for short-distance, two-way voice communications and are frequently imported into the United States. Many of these radios violate one or more FCC technical requirements. For example, some can be modified to transmit on public safety and other land mobile channels for which they are not authorized, while others are capable of prohibited wideband operations. Such radios are illegal, and many have the potential to negatively affect public safety, aviation, and other operations by Federal, state, and local agencies, as well as private users. Because these devices must be, but have not been, authorized by the FCC, the devices may not be imported into the United States, retailers may not advertise or sell them, and no one may use them." There have been reports of IMT's purchasing and using these types of radios (Wouxun and Baofeng) for inter-team communications. Theses radios are very cheap, are field programmable and operate on the same frequency bands used by the federal government both VHF and UHF. Teams must discontinue the use of these radios even in camp. Violators may be subject to substantial monetary penalties. Several NIFC kits are currently capable of using external power. To make adapter cables to power NIFC repeaters from external power sources use the part numbers and connector pinouts from the following drawings: Battery Cable Drawing (alkaline) and Solar Panel Cable. External power should be capable of supplying 4 amps (maximum) and a voltage of between 12.3 VDC to 16 VDC. Although the repeater will run on voltages down to 10 VDC, the external power source must initially be above 12.3 VDC to overcome hysteresis in the voiceboard. Once the hysteresis is overcome, the voiceboard will power the repeater from the external power source down to 10.2 VDC. Contact Bill Forsyth for more information. All NIRSC equipment has been reprogrammed to meet the National Telecommunications and Information Administrations (NTIA) 2019 requirements. DO NOT use old frequency pocket cards written prior to 2018. All 2018 NIICD frequency schemes for NFES 004381 and 004244 radios have the official markings "Controlled Unclassified Information//Basic" and must be stored and disseminated accordingly. They may be sent to interagency email addresses but not to non-official emails (i.e. Gmail or AOL email accounts). COML or COMT personnel should contact their GACC for the new frequencies. The GACC can then inform them how to access their secure site to obtain this information, or they may send it to a government email account. This information will also be stored on the NIFC FPT site under the radio_management folder 2018 frequency information. Access to this folder will require a NAP user name and password. The NIFC CDO Coordinator (Gary Stewart) and several others in the NIICD will be able to grant access to this folder on the FTP site. This can be done with an email to request access. Once the email is received the personnel granting permission will inform the individual requesting access the steps that have to be taken to be granted access. Contact Gary Stewart for more information. New bulkhead connectors have been installed on the above equipment to provide a weatherproof interface with the internal equipment and the external cables. This will reduce moisture and condensation within the kit boxes. Voice Boards - Voice Boards are now installed in all of the above kits. When using a solar panel this board allows the user to remotely query the equipment to obtain battery voltage and equipment temperature. A removable cover is installed on all alkaline batteries in the above kits to prevent the terminals from being shorted. DO NOT dispose of these covers, return with kit. The Command Repeater (004312) kits will now ship in 2 boxes due to shipping weight restrictions. This second box is identical to the second box that comes with an Aircraft Link (004370). All internal power connectors (Jones Plug and Socket) have been replaced with Anderson Power Pole connectors (PP1545). These new connectors are also in the Remote Kits (004330). All NIRSC RF cables now use "N" connectors. The NIRSC no longer uses any UHF RF cables. Any NIRSC antenna or component manufactured with a UHF connector has had an N adapter permanently attached to that UHF connector. Contact Kent Gale for more information. The purpose of this memo is to provide information about new requirements for radio frequency distribution. It also serves to inform the community of the misprinted Air Tanker Base Directory and corrective action taken. All documents that contain frequencies must be labeled at the top and bottom of each page with a disclaimer that says, Controlled Unclassified Information//Basic. Steps are being taken to update I-Suite to meet these requirements in the future. Additionally, work is being completed to edit any ICS forms hosted by NWCG while also coordinating with DHS/FEMA and FireScope. Any locally/personally controlled versions of ICS documents that you may have, that contain frequency information, must also display this disclaimer at the top and bottom of each page. Errors were found in the Air Tanker Base Directory printed May 2017. This issue has been corrected and the directory is being republished. Please ensure that the version dated "June 2017" is used. The corrected electronic version is currently on the NIFC FTP site as well as secure password protected sites at various GACCs. All versions now contain the Controlled Unclassified Information label. Relm/BK will no longer support four older models of radios due to these radios reaching the end of their life cycle. These radios are: DPH5102X, GPH5102X, GMP5992X and GPH5992R. These four radio types will still be accepted as Fire Approved. Contact Kent Gale for more information. See the attached information from Relm/BK. Here is something you can check if you ever run into the situation where you load brand new AA batteries into a clamshell battery holder and attach it to a radio only to find that the radio will not power up. Clamshell battery holders are designed so that in the event that a AA battery is placed backwards into the holder no electrical connection is made. This is accomplished by a molded plastic shoulder placed on each side of the positive spring-steel contact in the clamshell holder. These shoulders extend beyond the positive spring-steel contact of the holder (see diagram below) which will allow only the positive post of the AA battery to make electrical connection. The negative side of the AA battery is flat so the shoulders of the clamshell holder will prevent an electrical connection when a battery is placed backwards. New procedure to enable/disable CTCSS tones. COMC, COML, COMT, COM Refresher, and P25 aviation radio training courses are available. Visit the Technical Training page for more information. 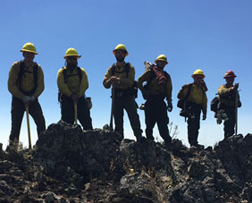 Family Radio Service (FRS) communications equipment shall not be used by anyone associated with federal wildland fire incidents or in instances that safeguard human life or property. This applies to agency, military, and contractor personnel. NTIA Manual, section 7.5.8, states: “federal entities may not purchase and operate FRS radios for planned communications operations that safeguard human life or property”. Additionally, the Departments of Agriculture and Interior have policies limiting the use of FRS radios.